/ When is the Great Tribulation Not Coming? Weeks after Mark Biltz's famous "blood moon prophecy" expired in September, 2015 I was surprised by a statement of Mark Biltz released by WND.com. No, he did not apologize for scaring lots of people with his prophecy speculation. That would indeed be surprising. If the Tribulation did not start on Rosh Hashanah in 2015, it cannot start until the beginning of a new seven-year cycle meaning Rosh Hashanah of the years 2022, 2029, 2036, , etc. These are the years that begin a new seven-year biblical cycle. Is he right? Yes and no. I'll explain below. First, what does "the Tribulation" mean? The Tribulation is actually a misnomer. There is no "the tribulation" in the Bible. Jesus in Matthew 24 referred to a time of "Great Tribulation" (Mt 24:21) soon after Daniel's "abomination of desolation" happened (Mt 24:15). The Great Tribulation is a time of the persecution of the saints by Satan through the Antichrist being in power. The "abomination" itself is an event near the midpoint of the "70th week of Daniel" (Dan 9:27) when the Antichrist seizes power of Jerusalem and erects the statue of himself in the Third Temple that the False Prophet commands to be made (Mk 13:14=Rev 13:15=2Th 2:4). The 70th week is the final block of 7 prophetic years ending in Jesus' return. This is what Mark Biltz and many are referring to when they say "the Tribulation." In fact, some use it interchangeably with the term the "Great Tribulation" thinking both are seven years long. However, if the Great Tribulation comes after the midpoint of the 70th week of years as Daniel 9:27 says, then it can be no longer than 3½ years long. In other words, it is the second half of the 70th week. In case you're curious, Jesus gave the first half a name too. It is called the "beginning of birth pains" (Mt 24:8). "The Tribulation," more accurately known as Daniel's 70th week, is mostly bad news. The terrible events described in Revelation 6 - 19 all happen within these final seven years. When Will The Tribulation Be? Thankfully, the apostles were no different and so they asked Jesus when the "end of the age" (Mt 24:3) would be, which is the final seven years which contain the Great Tribulation. In his very helpful response, Jesus stated clearly that no man knows when the end will be, including himself and the angels (Mt 24:36). Sadly, then, the answer to "when will the Tribulation be" is we don't know, nor can we know, at least not yet. Anyone who says otherwise or that they have figured it out is ignoring what Jesus said about date setting. They also are ignoring the utter failure of everyone before them who has predicted the end. However, that does not mean you cannot rule out many years when the end cannot come. OK, When Can't the Tribulation Be? In his answer to the Apostles' question about the timing of the end, Jesus gave us ways to understand when it was not near. First, he indicated that until a global cataclysmic famine and earthquake event came, we are to be sure "the end is not yet" (Mt 24:6, 7-8). More on that in this article on the Sign of the End. Similarly, you can also rule out many years along the way before you see that event based on the understanding above that the Great Tribulation is the last part of the 70th week of Daniel, or the final block of seven prophetic years ending with Jesus' return. This is what Mark Biltz was basing his statement on about the next seven years being safe. See, the 70 weeks of Daniel are 70 heptads or blocks of seven years. However, they are not just any blocks of seven years. The Torah (in Leviticus) introduces a seven year cycle for marking Sabbath years. Just as ancient Israel was to consider every 7th day the Sabbath day of rest, likewise they were to count every 7th year as the Sabbath year of rest for the land to lie fallow. No planting or reaping. If they obeyed, they would be blessed in the sixth year with an abundance to make up for the missing 7th year harvests. 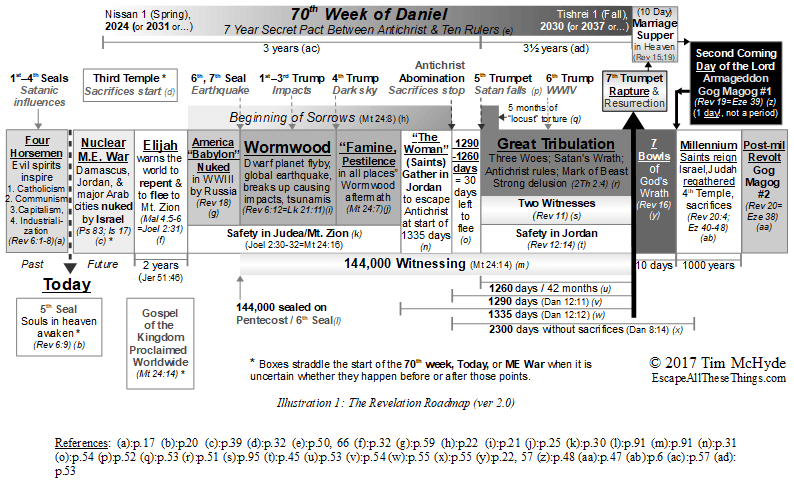 Daniel's prophetic 70 weeks of years are referring to these weeks of years, each ending with a Sabbath year. The 70th week is a Sabbath year cycle and begins after a Sabbath year finishes and ends in a Sabbath year itself. This means the Great Tribulation comes in the middle of a Sabbath year cycle and ends in a Sabbath year. We can use this knowledge to rule out the Great Tribulation several years in advance. Once a Sabbath year cycle starts, if everything is continuing as normal, then the entire seven year block is safe from being "the end." Nothing will happen the rest of the seven years! If we know when the last and next Sabbath years are, we can always know where we are in the cycle and what years are safe. I've been teaching the above information since 2003 and have not heard any other teachers teach in all that time. That's why I was surprised to hear Mark Biltz say what he did. It was a first. However, while he gets the principle right, he gets the implementation wrong. The next Sabbath year cycle is not beginning Fall, 2022 like he states. He's basing that information off of Rabbinical Judaism. At first glance, it makes sense to do that. The Sabbath years were given to Jews. Jewish rabbis have kept records of the Sabbath years. Who would know better than them when the right Sabbath year is? Except when you diligently investigate and compare Judaism to what the Bible says, you will find they diverge in many many disturbing ways. The Torah teaches that the year begins in the Spring, in "Aviv," the first of months (Ex 12:2). Judaism teaches it begins in the Fall, the 7th month. The Torah teaches the month begins with the new crescent moon. Judaism starts the month at a precalculated point 1-3 days before the new moon. The Torah requires the first month to start only when the spring barley crop is ready to be harvested for the wave sheaf ceremony (Lev 23:5, 10-11). Judaism starts the first month on a precalculated point irregardless of availability of barley (since Judaism does not bother to observe the wave sheaf). The Torah commands the celebrations of Yom Tseruah/Day of Trumpets on the first day of the 7th month (Lev 23:23-25). Judaism invents a new holiday called Rosh HaShanah that lasts for two days in its place (yes, instead of Yom Teruah). The same is true today. If you trust Judaism to teach you the Law, including the calendar and Sabbath years of the Law, you will be getting the leaven of the Pharisees that Jesus warned about (Mt 16:6). Will the True Sabbath Year Please Stand Up? On the Sabbath question, it turns out that even the rabbis don't agree in the Talmud as to when the Sabbath years are. Their opinions vary among four popular models, all within six months of each other because two work off the premise that the biblical year begins in the fall and two off a spring beginning. Since the Bible clearly teaches a spring start to the year, you can throw out two of the models and focus on the other two to determine which one fits historical records best. See this study for details. Also see Joseph Dumond's further research. The dominant Sabbath year cycle model used by the Jewish calendar today is one of the fall-start models. This is what Mark Biltz is trusting in, as most do, not realizing it is disputed. That is why he and Jonathan Cahn speak of the shemitah (Sabbath year) having ended "September 13th, 2015." I believe the correct Sabbath year model begins a year and a half later, in the spring. That would be Spring, 2016-Spring, 2017, not Fall, 2014-Fall, 2015. In the end, with how close these Sabbath year models are together, it really does not matter which one you think is right for the purposes of "Tribulation alertness." 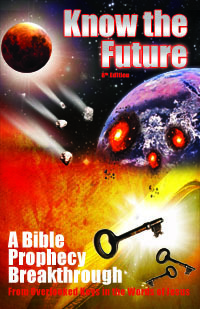 As my book explains, many prerequisite prophetic events must happen before the end. These things need to be happening shortly by the time the 70th week/Tribulation is starting for a Sabbath year cycle to be "the one." That's why I have already ruled out the Sabbath year cycle of Spring, 2017 through Spring, 2024 from being the 70th week as the chart from my book shows. With everything going as normal this close to the start, I'm confident it won't be the 70th week. We're safe from the end until 2024 at least. For more information on why I say this and what events lead up to the Tribulation, see my book or my article on why Jesus won't come back this year. The Final 7 Years? Or 6? Several readers have asked about an apparent discrepancy on my Revelation Roadmap chart above. They notice that the date ranges for the example windows listed (2017-2023, 2024-2030) do not cover seven full years. For example, 2024 - 2030 = 6 years. This would seem wrong with how many (including I) often speak of the "final seven years." First, is it correct to speak of a "final seven years?" It's true that Daniel 9 speaks of a final "one week" that the Antichrist makes a covenant for (Dan 9:27). A week of years is of course 7 years. As covered earlier, these weeks of years are not just any 7 years but aligned on the prophetic Sabbath year cycle of the Torah of Moses. This was six years of planting followed by a Sabbath year of land rest. Because Jesus returns at the end of this 70th week, it means he returns in a Sabbath year (which Isaiah 61:1-2 also alludes to). This mirrors how he declared his messiahship and the Sabbath year in the Sabbath year of the 69th week (Lk 4:21). Next we must remember that biblical years, including Sabbath years, do not start in the dead of winter like Gregorian years do. Instead, a biblical year begins fittingly at the start of spring, the time of rebirth. Thus when we talk about 7 year Sabbath year cycles, they also run from spring to spring such as Spring, 2024 - Spring, 2031. 2031? Then why do I list the example 70th week window above from 2024-2030 (6 years) and not 2024-2031 (7 years)? Because we already know that the climatic events at the end of the Great Tribulation including the rapture, Jesus' defeat of the Antichrist at Armageddon, and the setting up of his reign--all take place in the fall, in the 7th biblical month of Tishrei. Jesus does not wait until the end of the Sabbath year; he comes right in the middle of it. In other words, when I say "2024-2030" (an apparent 6 year range) what is meant is Spring, 2024 - Fall, 2030, which is actually a 6.5 year range. But what about how Daniel 9:27 says that Antichrist "makes a covenant for one week" or one Sabbath year cycle. Doesn't that mean he rules for a full 7 years? I used to assume so. Because of this, in earlier writings I would list the 70th week windows as 7 year periods from fall to fall. For example, the fall/middle of one Sabbath year (2023) to the fall/middle of the final Sabbath (2030). Why? Because of Dan 9:27, I felt I had to make it work out to exactly 7 years in light of Dan 9:27. First, Daniel's statement that the Antichrist has a covenant with his "the many/mighty" cohorts to rule for 7 years is not the same as Daniel saying "the Antichrist fulfills a covenant for 7 years." Or as the proverb goes, "the best laid plans of mice and men often go astray." An agreement to do something is not the same as doing it. Second, Jesus already said that the time of the Great Tribulation--the plans of the Antichrist--was going to be "cut short." Mt 24:22 — "Unless those days had been cut short, no life would have been saved; but for the sake of the elect those days will be cut short"
Various theories have been proffered to explain this verse. One says that the length of the day will be shortened. Others say that although we're told the Antichrist rules for 3.5 years/42 months/1260 days in Revelation and Daniel, in fact we can't trust the numbers because "the days are shortened." There are problems with both these theories. Of course, shortening the length of a day from 24 hours would not have any understandable outcome related to saving people's lives. If the length of the tribulation were not knowable or reliable then why give its length half a dozen times in not only counts of days, but months (42) and years (3.5), too? Mt 24:22 (HCSB) — "Unless those days were limited, no one would survive. But those days will be limited because of the elect." The meaning is clear that if the Great Tribulation were to go on one day longer, it would be catastrophic to the survival of the planet. In other words, the Great Tribulation were allowed to go one day past its 1260 days (Rev 11:3) to a length of 1261 days, the end of all life would happen. God knows this and "cuts it short." So you see, there is no need to manipulate the 70th week date range to make it work out to be an entire 7 years. We know the start is going to be spring because that's when biblical years start, including a Sabbath year cycle. We know the end is going to be in the fall of the Sabbath year six years later because Jesus comes in the fall and "cuts the time short" (Mt 24:22). This, then, is why my Revelation Roadmap lists 6.5 year ranges for the 70th week windows and not full 7 year windows. Which window it will be is of course something no man knows currently, nor do we need to, really. God's end time Elijah prophet will be sure to let us know when it is coming upon us and we need to act. I guess I don't need to know the exact time table? Because, really, isn't this all about my personal commitment to Jesus, rather than a calculation or time table? Absolutely this is not a "salvation issue" nor does it have any impact on our daily walk of loving God and our neighbor as ourselves to enter the Kingdom/have eternal life (Mk 12:28-34). It is however a wisdom and blessing issue for all who take the time to study prophecy (Rev 1:3). For me personally, having the actual start, end and length of the Great Tribulation right is indeed just a small point that only makes my teaching more cohesive and understandable. It explains what Jesus meant by "those days [of Tribulation] shall be cut short" (Mt 24:22). Jesus comes 6 months before the planned 7 year Antichrist pact is over. Kenechi, Yom Kippur DOES NOT start the sabbath year in contradiction to every other year starting in the Spring with Aviv. Why would God instruct them to sound the trumpet that day before the Sabbath year? Read the answer from a Jewish, native Hebrew-speaking expert, go to the heading “Q: What about Leviticus 25:9?”. Love reading your articles and thought provoking commentary. One thing that has confused me is that although I know the year begins in the spring (Exodus 12:2), Leviticus 25:9 seems to indicate that the Jubilee year begins in the seventh month. What are your thoughts on this and is it related to the 6 1/2 years mentioned in your article? Hi Jessica, thank you for reading. Leviticus 25:9 does not talk about the start of the Jubilee Year or change it. See “Q: What about Leviticus 25:9? ” at this link. I hate to say but you’re simply wrong. The Jewish year begins on Rosh hashanah (the head of the year) They mark their calendars that way. Dr. Alfred Eddersheim, and JOnathan Kahn who are all Messianic Jews. I have been to Israel and seen the celebrations. Ron, yes, the Jewish year (of those Jews who you look to for your Bible information) does begin on Rosh Hashanah. Regarding the biblical year, the Bible (which I look to for my Bible information) indicates that the month of Aviv/Nisan starts it (Ex 12:2) at the time of the aviv/barley harvest. This happens in spring in Egypt and Israel. I don’t know where others think that the Jubilee year is the 49th year. The last Jubilee year was 1967 when the Jews took back the land. 1967 was counted as a 50 year Jubilee year. Fifty years later 2017 is the Jubilee year. This could be a very interesting year. JoAnn, the Jubilee year is the 50th year from the 7th sabbath year, which is how it is counted. However, if you count from the last Jubilee year (the year after the 7th sabbath year), it’s 49 years or a 49 year cycle. 1967 was definitely not a Jubilee year, but 1947 and 1996 may have been. The next Jubilee year looks to be 2045. Hi there re the Jubilee year. Lots of different views on this one. For my part I would like to offer the following. The Jews have proclaimed that it is the financial beginning of the year. That is the way they (mankind) decided to do it. The bible does not say that the fall festival is the beginning of the year, only the 1st Nisan is given that title. So with that piece of truth, lets work from there. On the Day of Atonement after seventh sabbath year (49) the trumpet is sounded and the Jubilee year (meaning 50 years) is PROCLAIMED. In other words the coming Jubilee year is being announced for all to know so they can get organised. God always alerts/warns before an event. We know nothing actually starts to happen on that day because work is forbidden and it is a solemn high sabbath. However from that proclamation we know that from the beginning of the coming year we will be in a Jubilee. We need to be given this announcement to give the people time to plan and get organised. Lots of work needs to be done. Archive records have to be found involving much legal documentation, real estate is re-framed from one end of the country to the other including huge amounts of correspondence, involving leases, tenants, ownership titles, crops, stocks etc. People would have to move back to their homeland from various parts of the world. Bookings would have to be made, many arrangements etc. The preparation would easily take from Atonement to the following 1st Nisan. THEN on the 1st Nisan beginning the 50th year is the actual Jubilee year when it can be worked through. It is not a rest year in the normal sense of sabbaths. It is more a re-set type sabbath. God’s timetable is reset with a “0” and started over again. Hi, so I read up toward the top about the feast dates of Torah vs Judaism. So, when I schedule time off work for observance based off what my Google calendar tells me these Jewish holiday dates are, they are actually wrong dates? If so, do you know of a calendar to go by that is correct? John, There’s no calendar that we can verify is 100% correct. As my calendar page explains, the calendar was based on Israel being in the Promised Land with prophets, priest with urim and thumim, etc. to guide the nation on the right calendar based on the barley and crescent moon sightings. Since resting on these days is not required on anyone today and we lack the revelation from God on what they are exactly each year, it’s completely up to you what days you decide to celebrate them and in fact, how you celebrate them, another area of little information. Darrell, thanks. The problem is Rood sometimes deviates from the Karaite calendar because he has some modified rules that I don’t agree with. But if someone wants one of the better printed calendars, it’s a good option. Have you considered that if Jordan was to be nuked, perhaps there is no real potential safety there even though it could be approximately 7 seven years later, for a reasonably large number of saints from every corner of earth? Daniel, I’m not expecting on dissipation of fall out to be how there is safety in Jordan. Daniel 11 says Jordan is the place that escapes from the Antichrist which tells us where the Woman flees to in Revelation 12. To be safe there probably requires a miracle on scale with Daniel’s three friends in the fiery furnace. See post my post. I noticed on your chart above concerning the Rapture, that you say it happens after the Great Tribulation. My understanding is that the born again saved Christians are taken prior to the Great Tribulation. Why would God pour out his wrath on the saved? I know that there will be sinners saved during the Great Tribulation and therefore must suffer the wrath of God or lose their heads. Am I missing something here?? Ken, most Christians believe in a “pretrib rapture” as you have been taught and indeed are missing out on what the Bible teaches a post-trib/pre-wrath rapture after God protects us in one place here on earth. We are not appointed to wrath speaks of God’s wrath which is the 7 bowls lasting 10 days. Satan’s wrath is the Great Tribulation and we can be on earth for that. I must be misinterpreting these timetables but I have yet to find any website showing me 2024 starts a 7 year cycle. I tried to attach a website which shows the Sabbath Year begins in 2022, not 2024, but I guess you don’t allow website links. Anyhow….this was it so it is not linked ….. just add http and www before it if you want to look. I would appreciate any explanation as to why I can’t find a source showing 2024. Thanks. Paul, that’s because nobody talks about the start of the cycle (e.g. 2017, 2024), they talk about the Sabbath year that precedes it (e.g. 2016, 2023). If you refer back to my book you’ll find I link a study on proving the historic Sabbath years and establishing the original cycle, which is 16 months later than what Judaism says (because they start their corrupted calendar in the fall instead of the spring). Now that I got your book back out, I think I will reread it. My book is the 8th edition. I would imagine you are probably up to 10 now. For the record Tim, you labeled me a pre tribber in a previous conversation we had but I don’t think that is totally accurate. Today I would probably tell you this….I believe the four horsemen have already ridden and that the 6th seal is next up. I tend to see Daniels 70th week starting with some treaty/covenant which will allow a rebuilt Temple to be set up and probably a time of relative peace in the Middle East, especially Israel. But, as we get closer to the midpoint and the Abomination of Desolation, I believe the 6th seal and the rapture will occur almost simultaneously…..either just before or just after the Abomination of Desolation. I’m still not settled in my thinking on that. Obviously, the Trumpet and Bowl Judgments will happen in the second half of Daniels 70th week. So, as you can see, I’m not a pre tribber in the sense most people associate pre trib. I don’t consider myself a mid tribber either just because I see the rapture very close to the mid point. Lastly, I associate the multitude in Rev 7:9-17 as the raptured saints, and I don’t find it coincidental that this is right after the 6th seal. Anyhow, that is my thinking today, but I am always reading and not afraid to read different thoughts to test mine with, such as yours. For the record, I have deep respect and admiration for you and appreciate reading your weekly articles as I did your book. Write on, brother. Paul, what you describe is still pretrib thinking; a rapture coming before the tribulation, regardless of where you think seals, trumpets and bowls fit. But I’ll grant that you are ahead of most in that you don’t think the tribulation (5th trumpet) starts at the 1st seal. Thanks for your comment and God bless you, brother. Wishing you and your family a blessed Passover season. I’m relatively new to the concept that end time events are tied to the Jubilee cycle. I have studied Brother Joseph’s documentation related to the cycle and all his proofs. It seems conclusive but I have a question about Yahshua’s comments in Luke 4. He states that the year he is reading in the synagogue is “the acceptable year of the Lord”, which is language used to signify a Sabbath year or a Jubilee year. This was the beginning of his ministry and probably around 27/28AD. Was Yahshua giving us a clue to the Sabbath cycle? 27/28AD doesn’t correspond to a Sabbath year in Joseph’s cycle. What if the cycle is 3 years ahead of what we think??? If he wasn’t actually referring to the cycle, what are your thoughts on his comments and what he was talking about? Just thinking out loud. Jake, Joseph Dumond believes in the same sabbath year cycle I do and yes 28 does fall in a Sabbath year depending on what month you’re talking about. It sounds like we agree about the Nazareth Isaiah reading as indicating a Sabbath year very early in the one year ministry. It’s not possible for us to be three years off given there is no Sabbath year cycle theory in that space. The notable theories all fall within six months of each other and the grave stones, contracts and coins as a consensus of course narrow it down to and confirm them as the only possibilities.